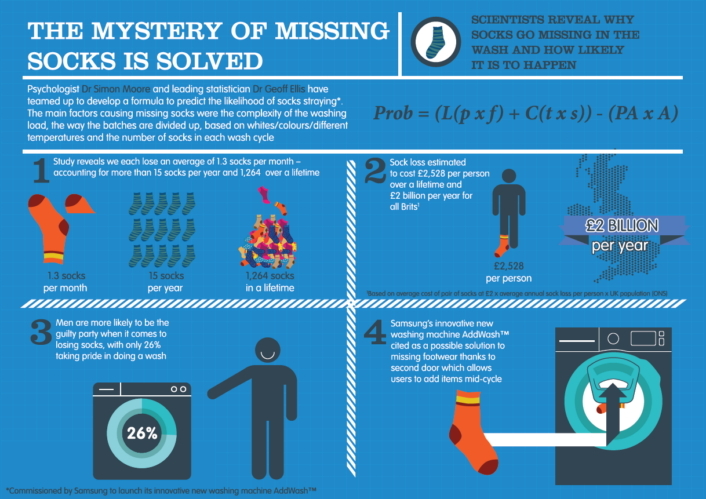 Leading scientists have unravelled the cause of one of life’s greatest mysteries by discovering the secrets of why our socks go missing in the wash.
And the research has led them to devise a mathematical formula to predict the probability of being left in a spin with odd socks after a washing load. The study, commissioned by Samsung to launch its innovative new washing machine AddWash™, found Brits lose an average of 1.3 socks each month (and more than 15 in a year), leaving them with numerous mismatches. With the average Brit living to 81, according to ONS figures, these cleaning catastrophes lead to the equivalent of 1,264 lost socks each over a lifetime, costing the average Brit a whopping £2,528. In all, these laundry losses mean around 84 million1 socks go missing around the UK every month. However, sock salvation is in sight. Samsung’s AddWash™ uses an innovative second door which allows users to simply drop in extra items during the wash cycle, providing a possible end to the problem of forfeited footwear. To mark the launch, chartered psychologist Dr Simon Moore and statistician Geoff Ellis applied science to socks in a bid to discover the factors which contribute to washday blues and to quantify their findings in a mathematical formula. Simply put, when a task is shared among a group, the tendency is for individuals to assume someone else will take responsibility – so no one does. This was a key theme emerging from many of the households interviewed. Heuristics are mental problem-solving shortcuts we use to save time and effort. For example, when we lose a TV remote we search in all the likeliest places such as under cushions. When socks disappear, we simply look in the easiest places and then assume the sock is lost forever. This occurs where we tend to believe something is true if we want it to be true. So in this case, if we cannot see any odd socks, we convince ourselves there are no odd socks. The research and survey were undertaken to mark the launch of Samsung’s AddWash™ range, designed to include an innovative door which allows extras items to be added during the wash – whether that’s a stray sock you missed, extra softener or a hand-washed garment for final rinsing. 1 According to the ONS (25 June 2015), the UK population is estimated to be 64,596,800. 2 Hawking, S. W. (2010) The Nature of Space and Time (Princeton: University Press 2010) 59. 3 The values obtained here are all coefficients created by modelling the sample in SPSS statistical modelling software.